Howard Greenberg Gallery is pleased to present an exhibition of photographs by Sarah Moon entitled Now and Then. In a career that has spanned more than forty years, Moon’s work has been exhibited widely in both the US and internationally including shows in Berlin, London, Moscow, Paris and Tokyo. 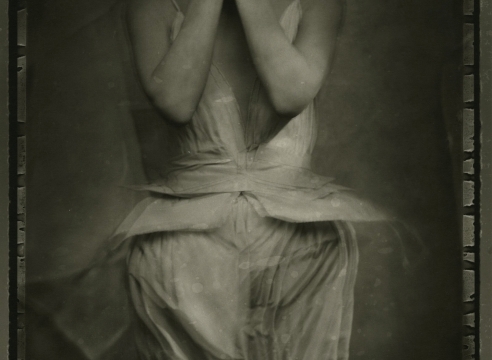 Born in England in 1940 to French parents, Sarah Moon began photographing while working as a model in London in the 1960s. What began as behind the scenes snapshots, quickly evolved into uniquely stylized images and a career as an in-demand fashion photographer. Eschewing the traditional fashion gaze and straight forward aesthetic of commercial photography, Moon focused instead on creating other-worldly atmospheres, often involving a staged narrative in which fashion played a supporting role. Whether shooting for Vogue, Elle, Harper’s Bazaar, or Marie Claire Moon’s images transcend the boundaries of the printed page.